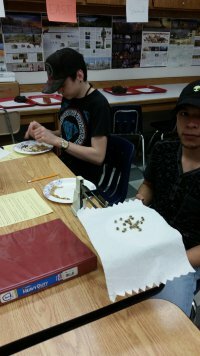 Environmental Science classes did a lab last week that had to do with “mining” for chocolate chips. They compared rocks and minerals to chocolate chip cookies. The cookie would be the rock (made of many ingredients or many kinds of minerals) and the chocolate chips would represent the mineral (one pure substance). 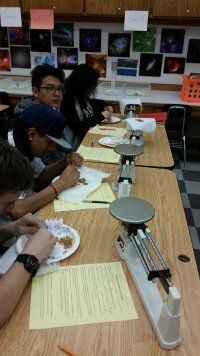 The students had to mine out the chocolate (minerals) from the cookie (rock) to see which brand of cookie would have the highest percentage of chips per amount of cookie (based on weight). The two brands we compared were Chips Ahoy and Keebler chips delux. Each group of two mined each cookie (one person had one brand, the other student mined the other) using only their mining tools (toothpicks). They weighed the cookie before hand using the triple beam balances and then weight the chocolate chips they mined after. Then using simple math they calculated the percentage of chocolate in each cookie by weight. They collected data from each group from each class and then averaged all the results, to account for error, to get our results. Environmental classes are still working on collecting their data, but so far Chips Ahoy has a higher percentage of chocolate than Keebler. Chips ahoy gives more cookies per package but the cookies are smaller. Chips Ahoy is 56 cents more expensive, but Keebler has larger cookies. So I guess it’s all how you look at it and what you want when making your cookie purchases.